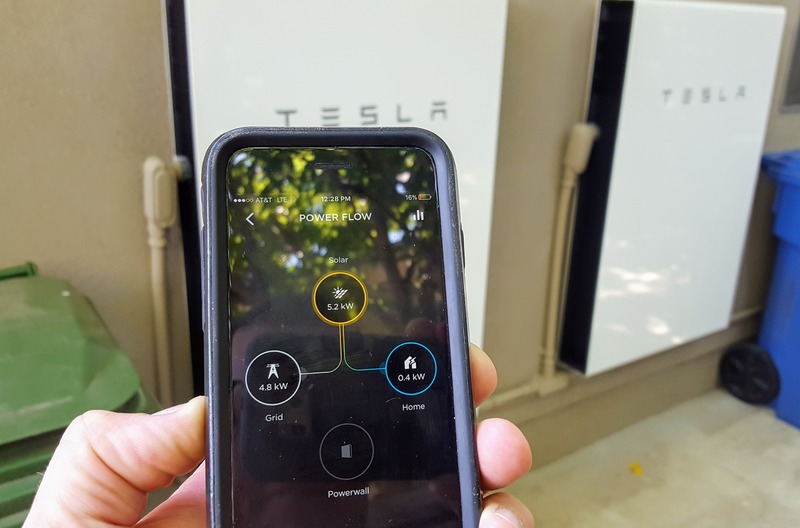 I had the opportunity to meet up with a local cleantech enthusiast named Nathan who tapped into the expertise of SolarCity (aka Tesla Energy) to install not one but two Tesla Powerwalls at his home. He also took the opportunity to extend his existing solar system in preparation for the addition of a Tesla Model 3 in the near future. 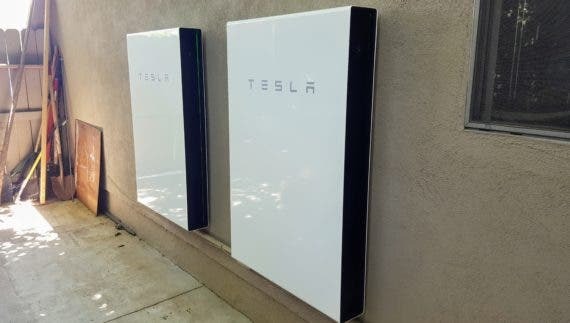 What I noticed immediately upon viewing them was how large they are on the surface, at nearly 4 ft by 3 ft | 1.1 m x .76 m, but how thin they are, at just 5.5″ | .16 m. As with most of Tesla’s creations, a Powerwall can sit comfortably at home as the centerpiece in a high-end custom garage installation and could also work well in a modern art installation. While not highly visible during the day, Powerwalls feature subtle green LED lights that pulse gently as a reminder that they are constantly at work. Powerwall integrates seamlessly with a solar system, the grid, and an EV in a smartphone app to give users full visibility and some control over their energy generation and usage throughout the day. It clearly shows generation from the onsite solar system during the day flowing to the home usage, the battery, or the grid, depending how generation and demand are balanced throughout the day. It can be further analyzed in graphs to understand how and when the system works and what can be done to further reduce dependency on the grid as desired. In-home energy storage products at the kilowatt-hour scale are still very new in terms of actual user adoption, largely due to the high capital cost, which is often compounded by the requirement for additional investment in raising base infrastructure capacity to accommodate the high power flows Powerwalls are capable of. The addition of 2 powerwalls, 24 solar panels, and 2 EV chargers can easily put the average home over its capacity for pushing and pulling power to and from the grid. At Nathan’s home, his install required an electrical service upgrade, which came with a fun requirement to trench across his neighbor’s property to run the new service line, a new electrical subpanel, and several new 240 volt electrical circuits. Infrastructure upgrades like this are all too common, and in many cases present a barrier to adoption of residential cleantech products like energy storage, solar, and EVs. They will not be the endgame for residential clean energy products but instead present yet another opportunity for innovation. For electric vehicles, for instance, “Level 1” chargers pulling 12 amps can push enough power into the average EV to more than offset the average daily driving range. My wife and I have two Level 2 chargers but typically only use Level 1 charging for our daily needs. Intelligent EV chargers like the JuiceBox by eMotorwerks are taking what were previously not much more than simple appliances tasked with conveying power from the wall to the vehicle and injecting massive innovation through the power of software. Intelligent innovation in EV charging is happening in parallel with energy storage, electric vehicles, inverters, solar panels, and every step along the way as the pain points related to procurement, installation, and use are eked out by early adopters. 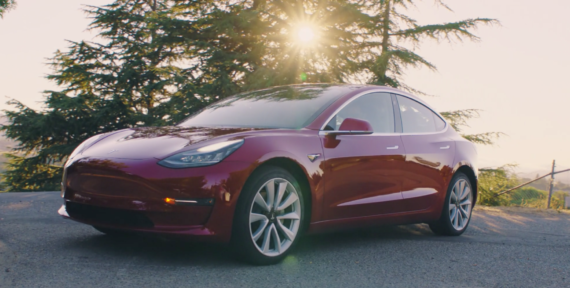 These early adopters have been eased into clean technologies for the home by incentives like California’s Self Generation Incentive Program, aka SGIP (CleanTechnica explanation of SGIP | SGIP official site). SGIP provides impressive early adopter incentives for many residential clean energy products, including Tesla Powerwall. In Nathan’s case, SGIP covered nearly $9,000 of the roughly $12,500 cost of the Tesla Powerwalls. The SGIP program is tiered, and with Nathan being the first SolarCity customer in SoCal to install two Powerwalls, his incentive will not be typical moving forward, but the program will continue to cover a large chunk of the total installed cost for some time. California residents can head over to the official SGIP site for the current incentive amounts. Nathan’s specific install is admittedly a head-on assault on fossil fuels and represents the tip of the spear. Installing energy storage, circuits for electric vehicles, and a massive solar system to power all the home’s cleantech goodies is a beautiful representation of how cleantech products are ready for the masses. These technologies are more than capable of harnessing energy from the sun, storing it, and using it to power the EVs, blenders, smartphones, and other creature comforts that drink power in homes around the world.